In addition to competitive metrics, we process info from other data sources, including Facebook Insights/Ads, Google Analytics, and more. The Connected Services page displays all of the social media accounts you can connect to Rival IQ. On plans with private data features, connecting to other social accounts allows you to access deeper metrics for your handles, including ads, reach and impressions. Mostly, connecting other social accounts is easy. Here are a few tips if you're getting stuck. Before you connect, make sure you are logged in to the right social account in your browser. If you disconnect your social connections from Rival IQ, we won’t be able to access your data - make sure you’re connected! 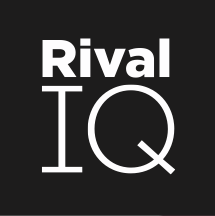 If you don’t have access to a social account, but your coworker or client does, you can invite them to your Rival IQ account and have them connect instead. Their connected data will be added to your Rival IQ account. Your API key is located on Your Profile page and can be used to access our API or connect to Google Data Studio. Note: API access is not available on all Rival IQ plans.